This deluxe set from Disney Store has 4 components. They are designed for a girl who wears size 7/8 clothing. 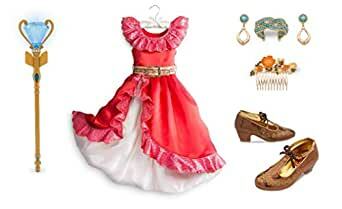 The theme is Disney’s princess Elena of Avalor. The 7/8 dress is red with glittery ruffles and a golden belt. The four-piece jewelry set has a bracelet, comb, and a pair of clip-on earrings. The golden jewelry has blue beading and orange flowers. The size 13/1 shoes are made of copper-hued faux leather with ankle straps and braided bows. They have golden flowers embroidered on the uppers. Elena’s scepter has a big blue jewel on top that lights up and plays beautiful music. Original, authentic and exclusive Disney products.